Some maybe surprised that food oil can be used in hair care, but people who are interested in this subject agree that best oils for hair are those most popular and not that expensive. It is similarly with sesame oil, about which we say some more below. 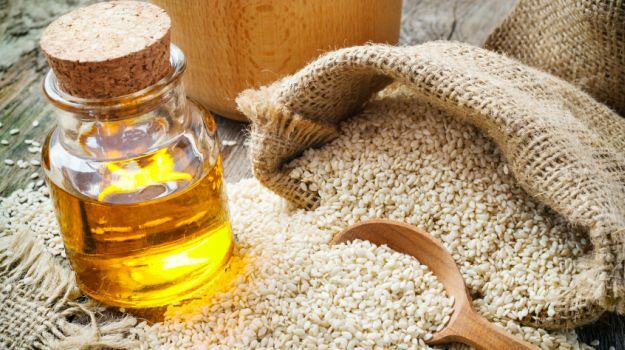 It is worth to know which oil to choose – cosmetic sesame oil differs from food sesame oil, but its properties stay the same. Good quality sesame oil has darkening properties. Regular use of sesame oil for hair makes hair get darker and problem of grey hair isn’t as visible any more. Scalp massage with sesame oil stimulates blood circulation in skin and nourishes hair roots. As a result hair grow faster, even those damaged after chemical treatments or weighted by stylisation. Among many qualities of sesame oil for hair, important are its protective properties. Sesame oil can be used as a UV filter, which protects hair against harmful sun radiation. Use of sesame oil in treatment of pediculosis is a bit less known method. However, antibacterial and antimycotic effects are confirmed for sesame oil in combination with essential oils. Use of sesame oil can effectively calm inflammations and skin irritations of scalp. Sesame oil for hair can also effectively cool and sooth irritated by, e.g. high temperature, follicles. To prevent dandruff and eliminate already existing problem, massage sesame oil in roots and leave it over night. Remember to rinse sesame oil really thoroughly of hair in the morning. Problem of dry hair can be eliminated with home-made moisturising hair mask – 3 table spoons of sesame oil, 1 table spoon of beetroot juice and lemon juice. Massage this mix in hair and protect with wet towel to enhance properties of sesame oil. Pure sesame oil for hair is like a conditioner with properties providing glossy hair. All you need to do is massage few drops of sesame oil in hair on their entire length to gain glossy hair. Unrefined sesame oil is perfect for enriching other conditioning products, like hair conditioners. Hot oil with conditioner will bring deep nourishment. Regeneration of damaged hair is a job for sesame oil, which will easily penetrate hair structure and provide their restoration.